Describes the manufacturing process and technical specifications for icewine. Includes details of Vidal, Riesling and Cabernet Franc varieties from Ontario, Niagara and Canada. Extensive fine wine tasting notes, recommendations, articles on major wine producing areas, wine sites, visiting wine regions, wine appreciation course and quiz. An exploration of the world of wine including wine and the Bible, storing wine, events calendar and wine toasts. Guide to the Riveland wine producing region. Includes information on wine tourism, and data for the wine industry. Premium sparkling wine, Pinot Noir and Pinot Gris from the Russian River Valley. Wine notes, vineyard descriptions, sparkling wine-making process, and wine quiz. Online version of noted British wine magazine features wine news and views, a wine auction price tracker, a wine forum and subscription information. Online wine magazine. Consumer-focused site giving reliable, interesting wine content, including buying advice, tasting notes, wine travel and feature articles. Wine reviews, wine deals and wine related discussions. Most wines reviewed are under $20 and are California wines. This is an open forum, feel free to comment on an existing post or add your own review, question or topic. Consumer-oriented wine magazine featuring wine reviews, features and wine travel tips. Column by Steve Pitcher. A resources for wine making and wine knowledge, dedicated to the educating both its members and the public in the art and science of home wine making and promotes the positive health benefits of moderate wine consumption. Portal of wine tourism in France. Guide of wine regions, articles, event calendar, directory of professionals in wine industry - wineries, cellars, hotels and restaurants, etc. Wine writer and judge Sue Courtney profiles a different New Zealand wine, wine personality, news item, restaurant, and reading item each week. Argentinian wine producer in Mendoza has four different lines in its portfolio, from table to sparkling wine. Brief description of each wine. Wine tasting sessions led by true connoisseurs. Weblog with wine related news and reviews. Wine tasting tours, residential wine courses and cookery classes in a 'wine school'. A wine blog exploration of world wine and viticulture through travels and tastings. Limousine wine tour of the Napa Valley and Sonoma Wine Country. Wine reference guides emphasizing visual learning, including the wine grape varietal table. Internet based wine tasting courses designed to suit the needs of beginners through to wine industry practitioners. Jasnieres and Coteaux du Loir wine producer. Presents estate, wine-making, wine range. Photo section. Producer of Correze Straw Wine, a red or white sweet wine for aperitif or dessert. History, wine-making, tasting notes. Wine lists, tasting notes, wine awards, online wine order forms, company profile, history and updated newsletters. If the business hours of Peller Estates Icewine in may vary on holidays like Valentine’s Day, Washington’s Birthday, St. Patrick’s Day, Easter, Easter eve and Mother’s day. We display standard opening hours and price ranges in our profile site. We recommend to check out pellericewine.com for further information. 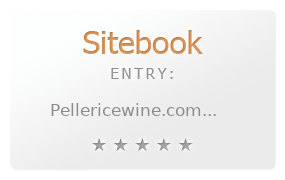 You can also search for Alternatives for pellericewine.com on our Review Site Sitebook.org All trademarks are the property of their respective owners. If we should delete this entry, please send us a short E-Mail.